Need a hero, more importantly a local hero, on the first day of play, Tuesday 31st October, at the 2017 ITTF Challenge Belgium Open in De Haan, look no further than Adrien Rassenfosse. 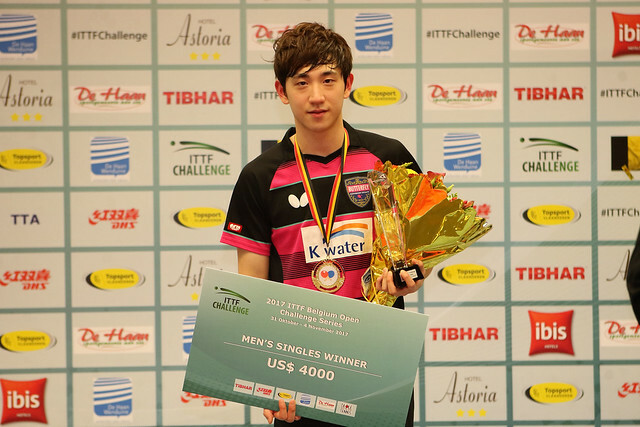 The 14 year old emerged the first player in the qualification stage of the Men’s Singles event to secure first place in his group. Furthermore, not only did the teenager secure first place in his group, he reserved a place in the main draw. He appeared in group no.13; players who secure first places in group no.1 to group no.24 advance directly to the main draw; those who compete in group no.25 to group no.40 must compete in a preliminary round. The winners of the preliminary round advance to join the 32 seeded players in the opening round. Most impressively and totally against the odds, listed at no.755 on the Men’s World Rankings, no 40 on the Under 15 global list, Adrien Rassenfosse beat Argentina’s Nicolas Galvano, named at no.466 (11-5, 11-4, 11-5, 12-10), prior to accounting for Jan Zibrat, listed at no.240 (11-9, 11-8, 11-6, 11-8). The win against Jan Zibrat is not one of note in terms of ranking but also when recent form is considered; Jan Zibrat was instrumental in the bronze medal success gained by Slovenia at the recent Liebherr 2017 European Team Championships. Success for Adrien Rassenfosse, his quite remarkable efforts overshadowing colleagues who also made fine starts to their campaign in the Men’s Singles qualification tournament. In particular, Valentin Pieraert caught the eye. In his opening contest, the 18 year old named at no.506 on the current Men’s World Rankings, beat Austria’s Thomas Grininger, listed at no.637 (13-11, 11-6, 8-11, 9-11, 13-11, 11-4). A win as status anticipated but then in the very next contest on the schedule, Thomas Grininger caused a major upset; he overcame Hungary’s Adam Szudi, ranked no. 189, the highest rated player in the group (11-7, 12-10, 11-9, 5-11, 12-10). Good starts for Adrien Rassenfosse and Valentin Pieraert; it was the same for Belgian colleagues Martin Allegro, Gaeten Swartenbrouckx, Lauric Jean and Thibaut Darcis who all recorded wins as status advised. Hard fought full distance contests Martin Allegro beat Canada’s Marko Medjugorac (11-13, 11-4, 11-6, 9-11, 11-2, 7-11, 11-5), Gaeten Swartenbrouckx overcame Egypt’s Abdelrahman Rahmou (11-13, 8-11, 11-9, 13-11, 11-9, 11-13, 11-7). Rather more comfortably, Lauric Jean accounted for Israel’s Gal Farfel (11-5, 11-7, 12-10, 11-9), Thibaut Darcis defeated Dimitris Kordoutis of Greece (11-3, 11-5, 11-7, 11-2).